NitroFert is pleased to announce the recent appointment of Rosalyn Drew as their Sales and Marketing Executive. 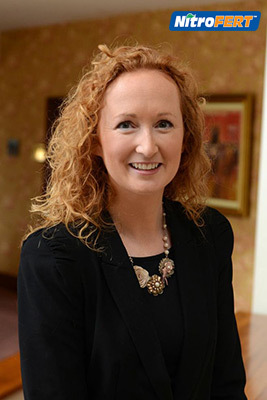 Rosalyn has been working in the agricultural industry since graduating from UCD in 1996. Holding a Bachelor in Ag Science and a Master in Business Administration, she worked as a grass seed specialist and technical sales rep for Drummonds Ltd. During that time, she managed all aspects of the grass seed business with responsibility for procurement, sales, customer care and marketing and built a loyal customer base for the Green Acres brand. With a background in dairy, beef and tillage farming Rosalyn has always had a huge interest in agriculture. In 2013, she was elected on to the council of the Irish Grassland Association and has worked with a network of influential contacts across the industry in the areas of farming, education, advisory, research and business. Are you all prepared to spread fertiliser?